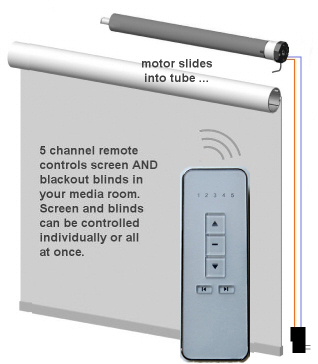 Level 1 - RollerTrol™ Simple Remote Controls: We designed our system so that you can start out with our simple wall mount and hand held remotes for our shade/blind motors and skylight/window openers, then upgrade later to a more advanced system. Your investment is preserved as any remotes you purchase will still work, even if you upgrade to level 2 or 3 later. The remote control signals will be 'learned' and used by the higher levels of automation (see our blind & shade automation guide). Level 2 - BroadLink® RF-IR Blaster Automation Hub: See our affordable blind and shade hub, operated by Android and IOS apps. This RF-IR blaster hub can learn RF radio signals for our blind motors and skylight/window openers and IR learning for TV. Convert old phones and tablets into WiFi home automation controllers! Level 3 - Z-WAVE® Blind Automation: This protocol is often used in home automation systems. We have a Z-Wave interface for roller shade and blind motors, and Z-Wave control of our skylight and window opener systems. You can also add support for voice control systems such as Alexa® and Google Home®. Mermet® Custom Shades: For those of you wanting a more complete solution, we are now offering high quality shade and blind fabrics from Mermet®, mounted on standard tubing. Our motors just slide in and lock in place - no fuss no muss! Please check our Custom Blinds and Shades website for info. SmartThings® has become one of the most popular home automation controllers for IoT (Internet of things). We decided to get one to add to the large collection of hubs that we have gathered over time, to see how well it would work with our blind motors and window/skylight actuator products. We liked the hub and found it very easy to set up and configure, but one thing to be aware of is that it is Internet dependent, so if your Internet is down or their cloud servers are down, your system won't work. This is one reason why it is important to have alternate control methods, as discussed further on in this article. The software programming is a different matter, though, when it comes to adapting devices to the SmartThings® hub. It uses a simplified Java language (Groovy) that ain't so simple. Thanks to some help from one of our customers, we were able to create a device handler for our trigger module. This script is included with your motor or trigger module purchase. This Z-Wave module can be used to trigger our Blind and Shade Group Transmitter (DCG-1R-RFT), and we also offer a group control kit that combines both of these items with a 12v DC power supply that supplies power to both modules. The Group Transmitter can control an unlimited number of shade and blind motors simultaneously, regardless of pre-programmed travel limits on individual shades. Note that these are both 12v units that use very little power and can be very easily used in off-grid solar power systems. Although this article is primarily focussed on the deployment of blinds and shades, we have stand-alone receivers that can be used to power any regular 12v DC motor. This includes our window and skylight openers, vent motors, shutters, fans, LED lighting, etc. Because this system uses digital radio signals to control the blind and shade motors, there is no need to run wiring through wall switches, you only need to get power to the device itself (or use internal/external battery motors). You can use any of our wireless remote controls for motors too, if you would like easy access wall switches or hand held remotes in your rooms. As we mentioned previously, the SmartThings® system (and others) are totally dependent on remote servers (often referred to by marketing people as "the cloud") for operation. If any part of the internet fails between you and them, or their servers go down, or your local hub fails, your automated home will be broken. Our wireless remote controls address the motor receivers directly, completely bypassing all the other control electronics. We purposely designed our system this way, so that we can offer system redundancy, and to allow users a way of starting out with very simple remote control, adding home automation at a later time. The choice of an HA system can require a lot of research to find the one that will work best for you, and our system provides immediate remote control of blinds, shades and other devices. We have interface products that will work with any home automation system (using relays), so if you bought a controller hub that you're not happy with, and decide to later change your HA system, you won't have to replace any of our products. Our high quality RollerTrol™ DC tubular motors for motorized shades and blinds with state-of-the-art remote control systems are precision engineered, safe for children and adults, and easy to install (see our new battery operated motors). These motors are perfect for making custom remote control window blinds (with optional LED room lighting control), sun shades, skylight shades, solar shades, night shades, projector screens, awnings, actuators, banners, flags or any application where you need a rotating tube. Our external stand-alone receivers will also control many other DC devices, such as fans, LED lighting, etc. The following list of home automation systems is not by any means complete, nor is it in any particular order, although we favour Stefan Stromberg's excellent OpenNetHome system. It is a snap to implement on the very affordable and capable Raspberry Pi Model 2B, and runs quietly in the background as a web server. You can still do meaningful work on the new Pi Model 2B (email, browsing, spreadsheet, etc) while the automation system is operating. Or, you can disconnect your monitor, keyboard and mouse and stick it in a cupboard somewhere as a dedicated controller. Everything is configured by browsers on other devices, so you don't need access to it. See our article about home automation on the Raspberry Pi.